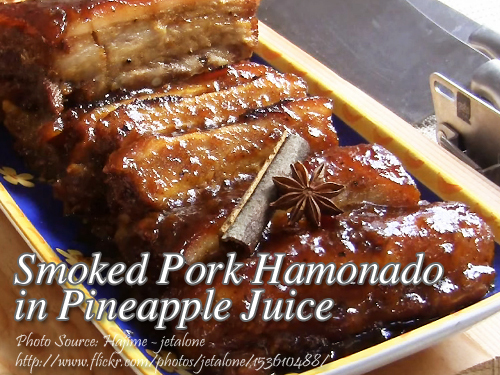 There are many versions of pork hamonado and the only ingredient that is the same to all of them is the pineapple juice. This recipe was an improved version by smoking the meat first and adding a little brandy. This is perfect for the holidays and other special occasions. Smoking the meat requires some extra time but the result will be fantastic. This method give the meat a special flavor and aroma that no ordinary pork hamonado can match. You can see and try the procedure here. But to make cooking this kind of hamonado easier, there is a smoke flavoring powder that you can buy in supermarkets. Prepare the meat by making 2 inches long cuts on the pork belly (the meat side) and deep enough to let the marinade penetrate evenly on the meat. Make some deep cuts also on the skin side of the meat and rub a generous amount of salt on both sides. To make the marinade, in a large bowl or container, mix all the ingredients, condiments and spices except the pork, and stir until the sugar dissolved and the marinade is well mixed. Then get a container that can accommodate the large chunk of pork belly. Get the smoked pork belly and place inside the container and pour the marinade. Place the container with the pork and marinade in the fridge overnight. In a large wok or pot put the meat and the marinade and simmer for at least 3 hours or until tender. Let the liquid evaporate until the mixture is reduced to half and add water if necessary. Pierce a fork to know if the meat is already cooked. Serve the pork in half inch slices. Looks interesting, especially as Christmas is getting near. I’ll try this one with a kilo of pork first to get the hang of it. Thanks! Hi Olenna, I’m sure you are going to love this dish. Thanks for your feedback!